Kelly's Korner: You Better Watch Out, You better Not Cry! You Better Watch Out, You better Not Cry! Ever since Harper was born - we really never go out to eat at night. We really don't do a lot at night. Harper goes to bed between 5 and 6 and usually she is on a major meltdown by then so it's just easier to be home. But last night Laurie and Steve called and wanted to know if we wanted to go eat. So we decided to be crazy and go for it. We went to eat at 5 so that helped. And Harper was an angel! Probably the best she has ever been when we've been out . I was shocked. Of course she LOVES being with Emily and Sarah Kate and just watches their every move. She also loves to stare at and talk to everyone around us. She kept talking to these two older couples sitting by us. I was so proud when I heard them say "That baby is SO good!" ha! And Laurie and I really enjoyed visiting! It was nice to get out for a change! Maybe we'll do it more often! We had a good morning at church and then we went to the mall to get a picture with Santa. I had no idea what she would do and I knew she didn't get her morning nap so it could get scary. But she did great! She would NOT smile but she also didn't cry. She spent a lot of time starting at Santa like "who are you?" This is her official picture! It will be fun to frame all her Santa pictures and put them around the house each year. We believe the reason of the season is Jesus and we will never make a huge deal out of Santa. But I grew up loving the idea of Santa coming to our house and leaving cookies out for him and my brother and I would go to the living room at like 4 in the morning to get a sneak peek and I want Harper to get that fun also! I just want a balance of her knowing why we celebrate and why it's more important to give than receive but also to have a little childhood fun! After that we headed to Tar-jay to pick out a couple of Santa gifts. This is the one year we could take Harper with us so we just let her look at things and whatever got the biggest reaction is what we got. We just got her three small things and I think that's more than enough. I can't wait for Christmas and to watch her play with her toys. She wore these bloomers today under under dress. Could they be any cuter? I'm going to be sad when I have to pack away all the Christmas outfits at the end of December. She's such a cutie pie! I am having a hard time figuring out what to do for our little one's Santa presents, we'll have to take him a test some stuff out! Glad you had a great day, and I L-O-V-E the Santa Baby bloomers, how cute! Oh-and to go back previous posts--you're totally not the only one who locks keys and a baby in the car--I did it last night! What a scary fiasco!!!! Kelly...those pix of her with Santa are tooooo cute. I did the same thing and framed pix of our boys with Santa all around the house. My favorite is our youngest who had just turned one and with his older brothers SCREAMING HIS HEAD OFF!!! Everybody laughs and loves it!!! I LOVE those bloomers!!! And her picture with Santa is so sweet! Her Santa picture is so cute! I love it! so so cute!!! 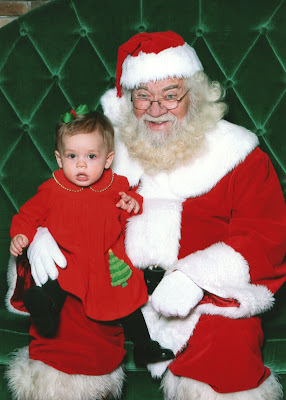 My daughter screams bloody murder if anywhere near Santa so we wont be going this year. I think we will walk by to say hi though! She has so many adorable little Christmas outfits. I'm glad she did good for her Santa pics! I love the pictures of my kids with Santa. I am so with you on balancing the real meaning of the season with a little childhood fun! Yay, Harper! That sweet girl did great. And dinner, too? Wow! 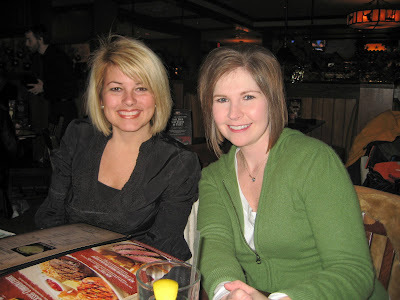 We never ever go to dinner-- but there is the occasional night where we say, "oh, let's just go for it!" It sounds like you all had a great weekend. Awe, she did great for her picture! Darling! Looks like Harper had a fun weekend! These pictures are too cute! Oh yes, she was PERFECT last night. I hope she will not learn ugly ways from SK. I love your cocktail ring in the last picture - where did you get it? Your daughter is adorable!!! Thanks for sharing! My parents always did a good job of separating the religious Christmas from the secular Christmas. I could have the fun but still understood what Advent and Christmas was all about. I think it helps that I'm a PK and would watch Advent get planned and spend 12 hours at church on Christmas Eve. Just wondering where you got your cart cover? I have found some online I like, but thought I'd check with you. Just darling!! At least Harper didn't cry...or SCREAM...like Jorgen did when my sis tried to get his picture taken with Santa! He was NOT having any of that! :) So, I'm so glad that Harper did so well. Also, so glad you got to go out to eat instead of bringing it home! What a fun treat, plus you got to chat with Laurie...double fun! That is uch a precious picture. We went out to lunch last week and Anderson was soooo good! So I can understand your excitement! Harper's picture with Santa is just precious! Thanks for sharing your weekend! Well, I love your green dress- could you tell us/me where you got it? I need dresses that I can wear to work that aren't cut down to there in the front. Harper is darling as always- you'll be surprised at how long they can actually wear the bloomers- AC wore hers from the time she was 6 months old until she was 4. So- she'll probably get a few more rounds with her cute little bloomers anyway! Too cute...Harper did great in her Santa photo! LOVE, LOVE, LOVE the precious little bloomers too! Glad to see you get out for dinner! It will get easier....believe me! We have 24 votive candles surrounding our nativity scene on our coffee table. We light a candle each night and study a verse in the Gospels telling the story of Jesus' birth. We make sure our kids understand why we have Christmas! But we still do "Santa" on Christmas eve, we just never make a big deal out of it. So cute! I have a Harper of my own a year older! I also have a great hair product I will send you for free for your flyaways! You will love it! www.shoptamz.com Send me your address & I'll send you a free bottle. I just wanted to say that my daughter, who turned one in October, has that tea set and loves it! She likes to pretend to pour her tea in the cups, but also all over the house and dog. Very fun! Have a wonderful Christmas! Love the Santa picture. We have that tea set you are holding in the picture. My daughter got it last year for Christmas and she loved it. I did too! We have had some great tea partys. When we had our kids, we decided that Santa would bring each of them 3 gifts because Jesus also received 3 Christmas gifts (always looking for ways to focus on Jesus). Now that they're 4 years old, it also helps to keep a lid on what they expect from the big guy on Christmas morning. I wanted to add an idea for the birthday party that's been a big hit for us. It works well as an ice-breaker and doubles as a way to make a cute birthday album for Harper. We set up a table with a selection of 12x12 scrapbooking paper, mat-sized paper and birthday/kid-theme stickers. I also cut out the number of their birthday in colored paper, about 3-inches tall. As the guests arrive, we invite them to make a page for the scrapbook album. If the kids are really young, the parents mostly do it, but by age 4, they can do most of it themselves. The pick their 12x12 then glue on the mat paper (where I put the photos from the party later on). They add the stickers and birthday number to finish it. I collect those and when things are settled down (a month later :-) I add the photos and do some journaling. It's a fun way to remember the friends who come to the party and it gets my album half-done for me, too! As the kids get older, they'll be able to write on the pages, too, with their memories of their special day. Moses is still too little to understand gifts etc, but I think next year we are going to start doing only three "Santa" gifts to signify the three gifts of the Magi. If it's good enough for baby Jesus it's good enough at our house! I think that's a good way to incorporate Santa and Jesus. P.S. If you see a little Fisher Price piggy bank with coins, that is an AWESOME toy. We still play with it everyday. Hey . . . how do you get the AWESOME SANTA? We always get the ones that "smell like beef and cheese!" Love the Santa and Harper picture! we took our sweetie girl (one on jan. 2!) to see santa - she s.c.r.e.a.m.e.d!!! the picture is too funny. She's adorable with Santa. We got that tea set for my niece - hope she loves it & that ring you're wearing is great. Have a good week preparing for the big day. There is an awesome book that we got my daughter (now 4) when she had her first Christmas, called, "The Story of Chrisistmas! It is called "The Christmas Story" by Patricia Pingry and published by the Candy Cane Press. It goes through the story of the nativity and ties in contemporary practices of gift giving to the nativity. (Jesus got gifts because the kings love them, we give gifts because we love Jesus and we celebrate his birthday). My kids love it and it is cool to see how other people get some of the real reason for Christmas. They also make them for a lot of the religious based holidays, Easter, St. Patrick's Day, etc. The bloomers are just beyond precious!!! Harper is SOOO cute!! She did a great job with Santa. I took our younger 2 today to see Santa also. Our 1 year old wanted NOTHING to do with him, but our 3 year old did pretty well. :)I LOVE looking at people's pictures with Santa, some of them can be SO funny. My high school cheerleading coach did the same thing with three gifts for each of her daughters. Just like Kylie above, she also said, "If three were enough for Jesus, then three are enough for my kids!" It sparked a lot of interesting discussion between her and her children over the years as well. I recommend you continue that principle, even if it was accidental this time. I'm not a mom yet, but I fully intend to use the same principle. I know a family who has a 10 year old, 14 year old and 16 year old - they did the Santa thing and painted the whole deal as a picture of grace - undeserved gifts. They are one of the neatest families I know and the girls are all really well rooted. She seriously is going to love that tea pot if you ended up buying it. It is one of Hayden's favorites, and someone just sent her another one, and I am going to put it upstairs so she has one both up and down so that I don't have to run get it because she is looking for it:) It is so cute and teaches such nice polite words. Hayden learned to say hello to people from that teapot and now she says hello all the time and sounds like a parrot...it is hilarious. You will have to tell me if she loves it as much as Hayden. Hope you all have a Merry Christmas, and a wonderful new year. Our Santa trip did not go quite as well as yours:( oh well we will try again next year. She screamed up just seeing the man in red!! Harper is PERFECT every time we go eat with y'all! She is seriously so good! I love the picture of her with Santa! She looks adorable! I realllllly hope you bought the teapot, my daughter Emma has two sets and love it soo much! Its the cutest little set ever! I had that tea set in my cart for my little girl yesterday and put it back!! We went with the little purse set instead!! Love the bloomers!! We always put my little boy to bed around 5 or 6 and people thought we were nuts! We never got to leave the house after sundown for a while. Now he is 3 and still goes to bed at 7. Have a blessed week and A very merry Christmas!!! We wanted our children to enjoy the fun side of Christmas too- and not upset anyone elses children who did Santa, but we couldn't bring ourselves to say he comes down the chimney or in the window when he doesn't. I had a real crisis of conscience about it. 1. Major on the Bethlehem story and Jesus and the angels. 2. Teach them the true story of St Nicholas- how he lived long ago, loved serving Jesus, and sneaking in gifts and money to the poor. 3. Say that the guy in the big red suit at the shops at Christmas time, is playing dress-ups as St Nick! This way they have fun, have the freedom to talk with him if they want, and don't spoil the fun for any Santa believing children. It's worked well for us anyway. I hope you bought her that tea set ya'll are looking at! My sweet girl got it as a gift at her first bday and it's been a HIT ever since! Harper's outfits are precious, as usual! We always did Santa too, for just a few things and the stockings. It is fun and imaginative for the kids and they still understood and knew the real meaning of Christmas. Harper is darling and her Christmas outfits are very fun! Glad to hear about your fun night out to eat with your friends. It is so fun to be spontaneous, even with little ones. Have a Merry Christmas Kelly and family!!!!!!!!!!!! I have always taken my kids pictures when they are looking at Santa and not posed/smiling. The awe in their eyes when they are looking at him and speaking to him is just priceless. When Harper gets older give it a try. You will LOVE those pictures. God Bless and yes, Jesus is the reason for the season. 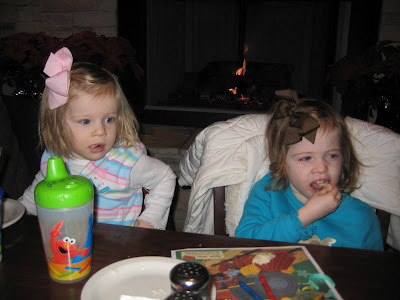 My kids think I'm CRAZY, but when I see kids who are really well behaved in restaurants or public places, I always make a point to stop and tell the parents how good they were. It meant a lot to me when my kids were young. I loved H's first photo with Santa. I still have mine from when I was about 4 years old. That gift that you are holding in that picture is the exact same gift my daughter just got for her first birthday. She loves it! Harper reminds me so much of my daughter. You are too funny! No need to explain the dress! It is a great dress and you look wonderful in it! After you posted the first post about it, I was on Belks for an hour looking around! Kelly, that is a huge moment in your marriage, life, etc. when you can finally go out for dinner again! Baby Harper is growing up. Those bloomers are too precious. I am going to be sad to put away my kids holiday themed clothes and all of the decorations! I saw Valentine's decor today at TJ MAXX and nearly fainted! This magical time of year comes and goes too quickly, I just want to hit a "slow motion" button! The picture of Harper sitting at the table is so good! Glad she sat with Santa this year. I have some of my pictures with Santa, so old that they are in black and white! Ha. Let us know if Harper likes the tea set. Laurie's girls are so cute. Glad you had a great night out. Harper is cuter and cuter...It has been such a blessing to meet you in blogland...You have enriched my life. Blessings to you and yours....Merry Christmas and a New Year filled with many blessings. Harper is just too cute, and I'm so excited that you and Scott had the opportunity to go out and have a nice meal with your friends! Good for you! I love the toy she is playing with. I fell in love with it in the store when I saw it. Oh how precious! I truly wish you guys the most beautiful Christmas! Where are the bloomers from? They are tooo cute! Glad you had success with the Santa pictures. And I love your view on Santa/Jesus. It makes me sad when parents completely rule out Santa. I think you nailed it perfectly...it's all about balance! Hey Kelly, I've never participated in the "show us your life Friday's" because my house before was SO small and frankly, I was a bit embarrassed! But, times, they are a changin! We got moved in to our new house this week (well, it's a process but we are slowing getting settled) and I wanted to share a holiday idea. At Kohls, you can buy letter ornaments that look like decorated sugar cookies. 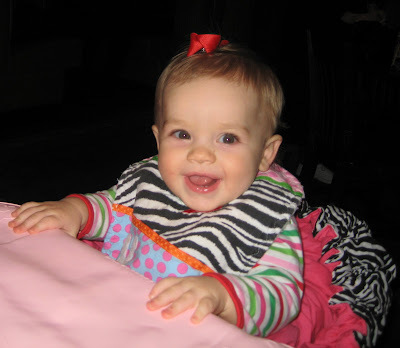 Last year, was Bailey's frist Christmas and since her b-day is Jan. 6 she was about Harper's age this time last year. We bought B A I L E Y letters and hung them on our tree. It's posted on my last year's Christmas post (no time to post pics this year). But it is a cute idea and she LOVES seeing her name on our tree. So you could do the same thing for Harper (I mean if you're in to the whole having your child's name on stuff, HA) Also, I have to tell you, Bailey is VERY upset right now looking at this picture of Harper in her rocking chair b/c she thinks it's her chair. haha! Oh, and Bailey got that tea set last year for Christmas and she LOVES it! Glad Harper did sooo well for you out to eat and you were able to enjoy and chat with your BFF! The Santa picture is to cute! It is fun to look back at the pics! Kelcee is 3 and I LOL when I look at them 'cause they are never the best but oh so funny! Anywho I love Harper's "Bloomies"! Oh my goodness, Kelly! I think you are so funny with your green dress comment! ha! Of course I would have said the same thing. hehe. Harper is SO pretty! I love those little bloomers. We had bloomers of all different kinds to fit our little one 'til she's about 5! I love bloomers! SO cute. All the Christmas outfits are so precious and it makes me so sad too to have to put them away at the end of December! But I think now I've learned just after this one Christmas season w/Hayes that I'll start looking for snowman and gingerbread outfits that she can wear all winter instead of just December! At least we can get a little more wear out of them! also, we get nervous about taking Hayes out at night too (11 months old) but we have found that when we're away from home at night she does SO much better than she would at home. If we're home then it's totally bedtime around 6:30 or 7 and she's so whiny and fussy. But if we're out and about and she's out of her element she does better. Sounds crazy! If we go out to eat at night we just have to keep a steady stream of food to her mouth-lots of Cheerios! Merry Christmas to your sweet baby girl Harper-such a doll! and to your whole family. Love keeping up w/you!! The toy in the picture? I hope you bought it. My Makenna (16 months) loves it. She prances around the house dancing to the tunes! Harper did so great with Santa! Those pictures are the cutest! I love the bloomers! Her picture with Santa is a hoot. It appears she loves eating out! Your previous post mentioned snow. My friends got married on Saturday during the blizzard...we got 23.6 inches of snow!!! I have pictures of the snow on my blog...check it out! BTW...love your blog! I read it almost everyday. I love her picture with Santa! Jake and I were talking yesterday about doing the Santa thing but making sure Caleb grows up knowing what Christmas really means! I had fun believing in Santa and want my kids to also! Since I won't see you this week, Merry Christmas!! I teach at a christian school and as were preparing our shoeboxes for operation Christmas child, a child asked "Why doesn't Santa just come to their house too?" Whoa-what do do you say to that? I totally understand children and imagination and also understand the difference between truth and lies. People can justify it however one wishes but to me it's black and white. Another thought-have you ever thought how the "world" has made Santa replace Jesus-"sees you when your sleeping, knows when you awake sees when you've been good or bad"?? seriously??? who can do that expect my LORD Jesus who loved me so much that he came to earth as a baby to grow up and die a horrible death to save me from my sins?? and that is what I want my kids to understand. I think we as Christians better wake up and realize that no one can serve two masters! I would never want to offend anyone, but my conscience cannot rest until I share. "Childhood fun?' is it really? Something to think about and pray about. Harper was born on my daughter's 4th birthday and I remember talking to her and explaining how sick Harper was and remembering how we prayed for that baby on the 'puter at bedtime and other times. She has enjoyed watching that "baby" grow and watch God answer her prayers! So wonderful to see the miracle God performed for you and remember the miracle of eternal life Jesus brings! I'm new to the blogging world - what fun! Honestly - your precious baby ...I could eat her up and I don't even know her!!! Thanks for sharing your heart and inviting us into your home each day. You are a blessing!!! Psst: My daughter was on your prayer site - for women trying DESPERATELY to have a baby. After 12 long years God has given her the desire of her heart. She and her husband will welcome their little girl into the world in February. GOD IS GOOD !!! Oh! Give that sweet girl lots of hugs from us! Kelly, I had to laugh when you were pointing out that you believe Jesus is the reason for the season--do you think anyone would doubt that?! It's hard to imagine a more Christ-centered household. Santa's just for fun but we all know "Christmas would come just the same" (like the Whos!). Just a thought for the future and one way to reconcile the "Santa side" of Christmas with the real one! I know this will be your merriest Christmas ever. May 2010 bring you even more blessings beyond your wildest dreams! if you bought that tea set, good choice!! one of the little girls I babysit turned one this week and at her party on Saturday she got 2 of them and a 3 rd person had bought it as well, but returned it after she found out L was getting it already...L LOVED It!! it's soooo cute. I love the picture of Harper with Santa. She's just so sweet! As for Santa gifts... I have always told my kids (once they were old enough to understand) that they could only ask for 3 things. When I read the local paper's Santa lists some of the kids go on and on about what they want. I knew that if my kids could only ask for 3 things then they would think about it instead of asking for EVERYTHING on tv. This has worked well for us and the kids have never been disappointed when they get up and see what Santa left them. P.S. The bloomers are super cute!! Her bloomers are too cute! Glad y'all had a nice dinner. Love her Santa picture. She is adorable. We do both Jesus and Santa in our house with our 2 year old little boy. We make sure that he knows that we celebrate Christmas because it is Jesus's birthday but that Jesus loves us so much that he lets Santa bring us his birthday presents. We'll light birthday candles and sing Happy Birthday to Jesus this year also. My niece has that talking tea set and she LOVES it! It's precious! As are Harper's bloomers!!! Cracks me up that you explained about the dress! :) I am sure there would be some that noticed, I didn't. Ha! But so excited we share the same birthday!! That's how we feel about the whole santa thing. Glad to know we aren't alone. BTW - we got that tea set thing for our 1yr old. Can't wait for her to play with it. Love the bloomers! I hope God blesses me with a daughter one day! They look like so much fun to dress up! Those bloomers are adorable! And I really like the picture of you two showing them off. That would be a great one to put in a cute Christmas frame. When we were kids we were only allowed to ask for three things at Christmas because baby Jesus only received three gifts. It really helped prevent the "gimmies" and between grandparents, other family, and friends we still received way more than we needed! 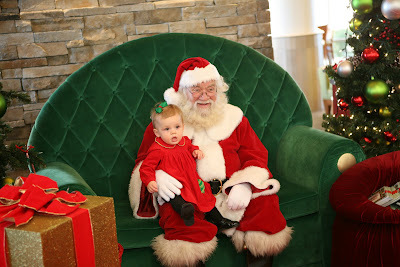 Harper's pictures with Santa, what a wonderful way to capture these memories! Her dress is absolutely precious.